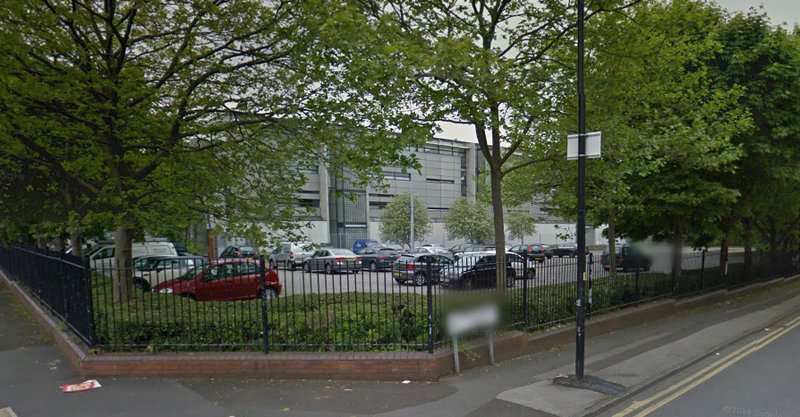 For anyone following my story from the start, you may be wondering – What ever happened to Salford Chapel? 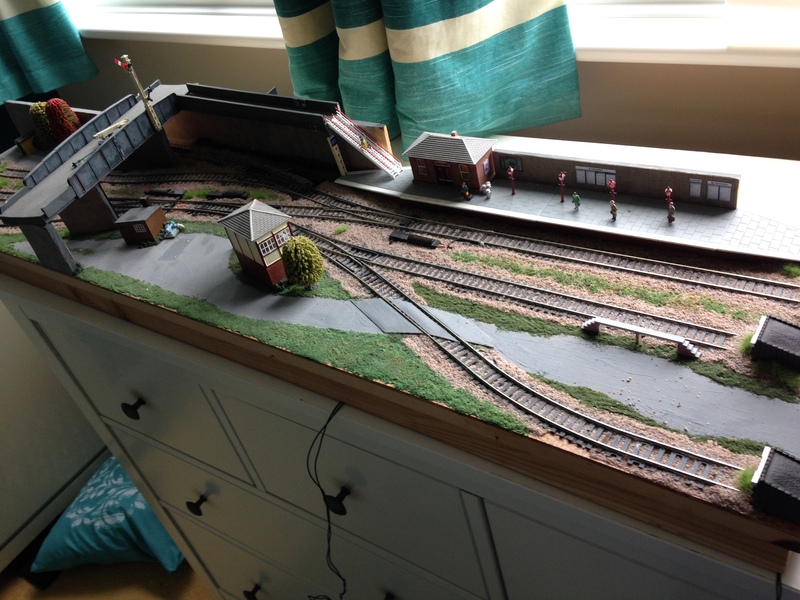 And for those of you not in the know, Salford Chapel is a 2nd layout I started working on maybe a year or so ago. It’s a sad moment when you decide that you’re not getting the most out of a layout as you first assumed you would when you started it. This moment of revelation happened to me last night with Salford Chapel. Salford Chapel’s inception began whilst I was living in my old flat: Because I was sharing with other people at the time, it was not practical for me to have a permanent layout. Whilst my flatmates of the time were very accommodating of my model railway obsession and development of main layout (Langstead), it seemed unfair to have it out being worked on all the time. That’s why, as I’m sure you’ve read countless times before, Langstead was originally designed to be split in half and stored away. 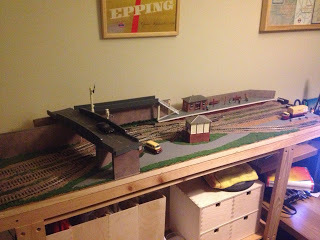 To fulfil my model railway addiction whilst Langstead was in storage, Salford Chapel was born. It was a modest shelf (end-to-end) layout, no bigger than 120x30cm that I could have out and work on in my room. I even gave it a locational back story that set it in, you guessed it, Greater Manchester. It took the form of a small city terminus with accompanying yard and sidings. At the time, it even had better facilities than Langstead, with fully motorised points, and isolation sections for multiple locos. When a layout hasn’t been used for a year and a half you have to be honest with yourself about it’s future. I’ve decided that I’ve got no plans to develop Salford Chapel any further, especially as I’ve got so much going on on my main layout, Langstead. SC’s space could be put to far better uses, so it’s time to dismantle it. So what happens when you decide to Dr Beeching your layout? I did toy with the notion of selling it as is. It is after all fully operational, and with a bit of love, care and a duster, could be brought back into life for somebody. Whilst that’s got the layouts best intentions at heart, I can’t be bothered with the faff of selling it, and after all the potential buyer may only want it for it’s components anyway. It’s at this point that I figure, I could find a use for most of the points, point motors and buildings in the development of my two upper tiers. To buy these things new would be expensive and pointless if I’ve just got them sitting around gathering dust on Salford Chapel. 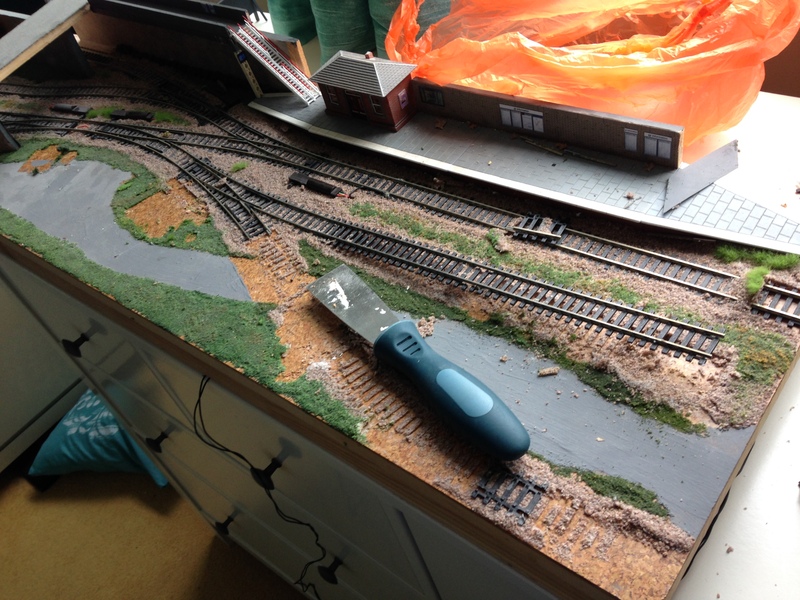 You may assume that once you’ve nailed down track, ballasted, and glued scenery and buildings onto a layout everything irretrievable. 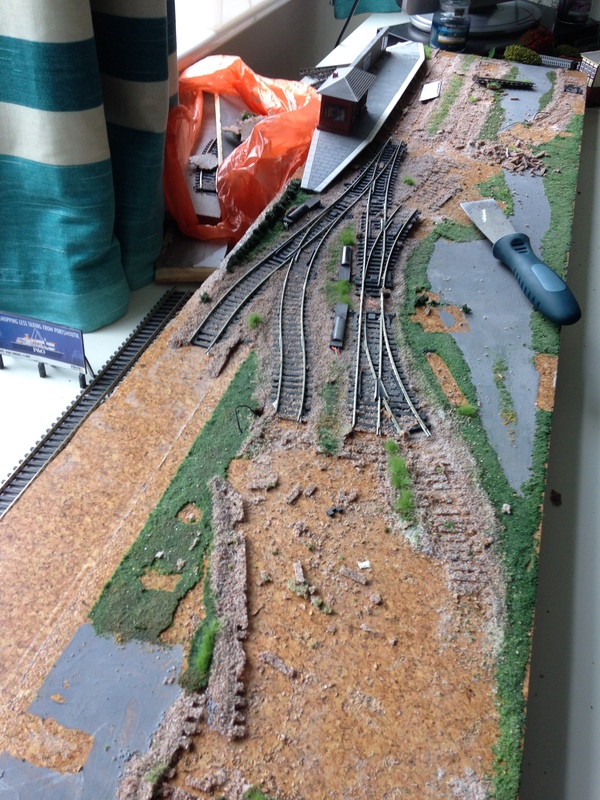 Depending on how you’ve adhered things to your layout, with a little care you should be able to salvage most of the valuable and important assets. First things first, strip away any detail. I’m talking people, buffers, small buildings etc. Everything stuck down to Salford Chapel was done so using UHU. It’s very good at holding things in place, but it also doesn’t put up much of a fight if you want to remove things. All the people, lamps, and buildings came away with varying degrees of persuasion from my hands or the spatula, all without damage. You can scrape off any scenery and excess glue later. Because I originally used cork floor tiles (with a slightly plasticy coating) on the layout as underlay, scraping the ballast off, and lifting track pins with a spatula was relatively easy work. Do take your time, the track will allow some flex and give but try to break away as much ballast as possible before you attempt to lift it, and try hard not to bend it. The points are the hardest to lift due to their intricate fittings. Make sure track pins are lifted, and get as much of your spatula underneath as possible before you lift. If you’ve got complicated point work in the middle of your layout as I have, work from both ends inwards, and lift the points last. Be frugal and think of ways to recycle as much of the layout as possible, there’s plenty of things of value to be used. If you really don’t want to hang onto any of the things bellow (especially track and buildings) you could always flog them on eBay or to your local model shop for a quick few quid. Track: As long as you’re careful, this will be absolutely fine to use again. Point Motors: Same as the track, they’ll be fine to use again as long as you don’t bend or apply too much strain to them when you lift them. Make sure you unscrew any wiring terminals underneath the layout before you attempt this, and never pull the wires using the unit itself. Buildings/Figures/Vehicles: They’ll come with bits of scenic residue attached once lifted but this is easily cleaned. They’ll definitely be the most usable and valuable parts to salvage (especially if they are good quality Skaledale ones like mine). Wiring/Terminal Blocks/: Salford Chapel had metres and metres of wiring for such a small layout, hang on to this, it’ll almost definitely come in use in the future. 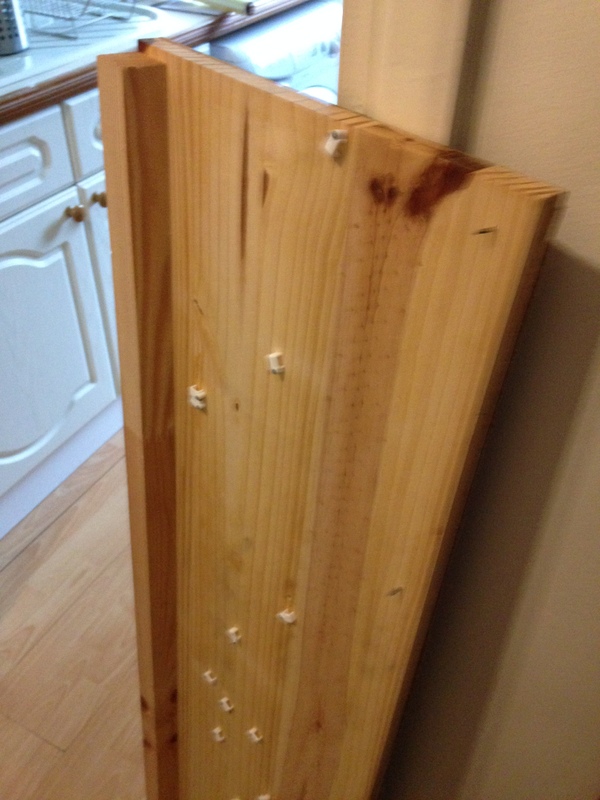 Wood/Base Board: It may have scenery stuck to it, but some of it might prove useful in the future, especially some of the off cuts. If they’re not layout material, they could end up being used to prop things up whilst you’re waiting for glue to try, or to apply experimental scenery to. The under frame of SC’s baseboard is still in very good condition (bellow). Ballast: It’s definitely not reusable as ballast but you can fashion it into scrap loads for wagons. No matter how careful you are, do expect a couple of things to break. I’ve got one set of points beyond repair, and all the Hornby ‘mini’ straights have disintegrated in the lift. Still, I think that’s pretty good going, and I’ve come away with a box load of stuff to reuse. It’s a sad day to get rid of Salford Chapel, but it wasn’t getting any use and in a way that’s even sadder. The project wasn’t in vain though, I learnt a lot through building it and have applied those skills developed to ongoing work on Langstead. 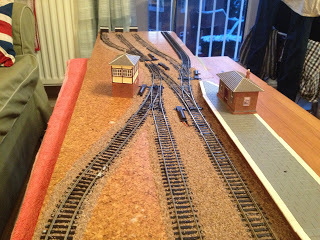 Track, point motors, buildings will now shortly be put to good use on my main layout – which is taking shape nicely. More updates on Langstead’s development soon. 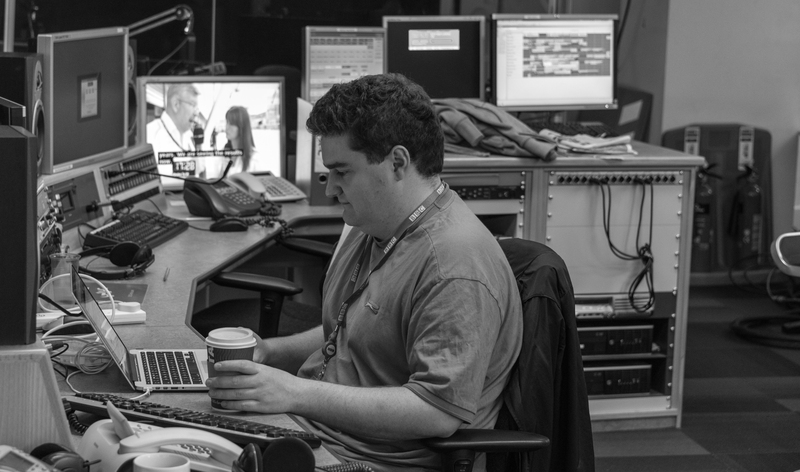 When one layout ends another one begins… just ask LocoYard.